The Quoting System for Excel (Quote Generator) is a simple Excel quote template with the ability to load saved customer and product details to quickly produce quotations for customers. The quote template can be customized with style and company logo and the quoting system provides advanced features such as applying exchange rates for multiple currency quotations. 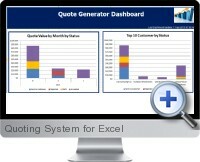 Customer details are managed separately and can be quickly selected for creating quotes. Products and services can be defined with prices and rates for quick inclusion in the quote template. A percentage increase or decrease to product or service prices and be applied to accommodate pricing strategies and promotional discounts. Exchange rates can be applied to individual items allowing for multiple currency quotations for international use. Generated quotes are saved for subsequent modification or analysis. The quote template within the quoting system can be customized with company styles and logo. Customized text can be set for all quotations, such as payment terms and delivery specifications.